DOUBLE AD IMPRESSIONS (i.e. HALF PRICE) for all Banner Advertising booked and paid for before the advertising start date. 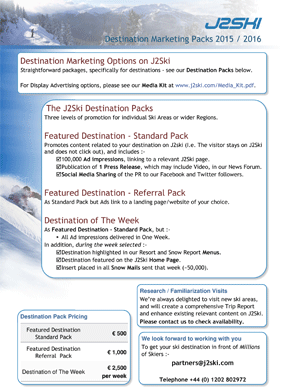 See our Media Kit for our traffic stats, and email us on partners@j2ski.com NOW! Why should I Advertise on J2Ski? Well, did your Advertising Budget get you the best value last winter? For a whole lot more exposure for your Ad Spend; talk to us! 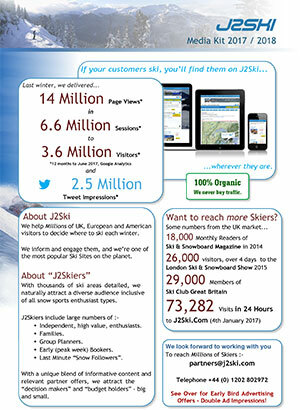 In season, J2Ski.Com receives over One Million Visits per month from more than 500,000 Unique Visitors. Note :- The information on J2Ski, where not clearly factual, is opinion only and is neither definitive or exhaustive. Warning :- Snow Sports are Dangerous! Skiing, snowboarding and all winter sports involve risk of serious injury or death. You MUST confirm all information, especially snow and weather conditions, locally before you ski or board. You participate at your own risk.